This documentary production process is probably the most misunderstood. Most people think the film just comes together without much planning. I imagine there are people that can do that, just select the clips, place on the timeline in the NLE (non linear editor) and slap it together. I try to plan and form a workflow that lets my brain create rather than over work the neurons and spend a lot of time trimming, re-working etc. I have several pre-trip interviews, getting a feel for what the participants expect and hope to learn. 82 minutes of interviews. Just how much of this I will use won’t be determined until the end. 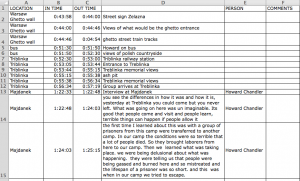 I like to transcribe the interviews and place those in a spreadsheet with timecode start, end, subjects name, and the text of the interview. I do the same for the B-roll (other visuals-panaramas-video of activities) This makes the selection process easier, at least for me. More on the process of selecting and forming the documentary later. This might be an extra step in the process of transcribing but I like it. I render the video as a small 320 x 180 H.264 with timecode burned in the video. These small files are easy to play, I don’t have to use the large 1080i video. I can also share this with people who assist in the production. 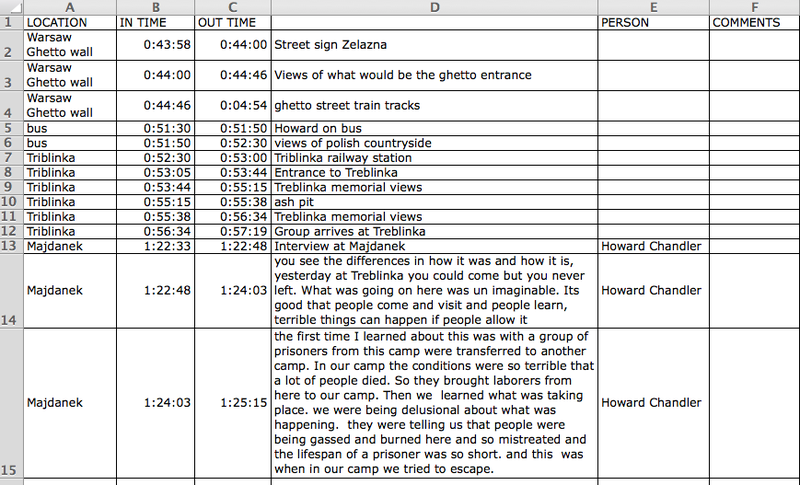 I open a spreadsheet and just plow thru each of the interviews, now is when I wished I had learned how to type. I am experimenting with a program for IPad and IPhone. VDictation (99 cents) might take the drudgery out of the transcribing process. It does not do everything perfectly, but if I can save 80% of this logging process, I might have more time for blogging. This entry was posted in The Editing Process. Bookmark the permalink.